This seems to be promo week at The Ink. You might recall a posts about my friend Erin Ivey. Well, she is about to release her first full length album called The 11th Floor. You gotta go listen to some of the samples. It is simply outstanding and diverse. You can Pre-Order her CD. It’s release date is May 5th. Go and Buy it now. Come on, now…we’ll be here when you get back. 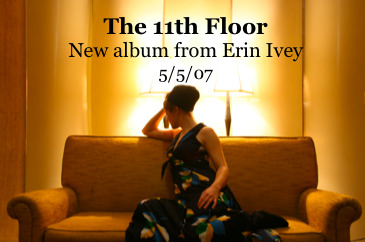 It has been a fun journey to dialogue back and forth with Erin over the years and as she has created the music that has become The 11th Floor. She’s a rare breed of artists that carries a wide range of musical influences, sounds, and tempos in her quiver. Which means you won’t have trouble finding something you like no matter your taste. If you are in the Oregon area she is playing a release show on May 10th. And all you Seattle folks should road trip for the show...why not, eh?I know if I could jump a plane to Portland I would be there myself:) So check her out, tell your friends, and support an indie musician that is worth it!